"Clark Field" redirects here. For other uses, see Clark Field (disambiguation). 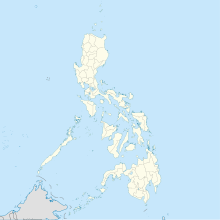 Clark Air Base is a Philippine Air Force base on Luzon Island in the Philippines, located 3 miles (4.8 km) west of Angeles, about 40 miles (64 km) northwest of Metro Manila. Clark Air Base was previously a United States military facility, operated by the U.S. Air Force under the aegis of Pacific Air Forces (PACAF) and their predecessor organizations from 1903 to 1991. The base covered 14.3 square miles (37 km2) with a military reservation extending north that covered another 230 square miles (600 km2). The base was a stronghold of the combined Filipino and American forces during the final months of World War II and a backbone of logistical support during the Vietnam War until 1975. Following the departure of American forces in 1991 due to the eruption of Mount Pinatubo, the base eventually[clarification needed] became the site of Clark International Airport, the Clark Freeport Zone and the Air Force City of the Philippine Air Force. Maj. Harold M. Clark, for whom Clark Air Base was named. Clark Air Base was originally established as Fort Stotsenburg in Sapang Bato, Angeles in 1903 under control of the U.S. Army. A portion of Fort Stotsenburg was officially set aside for the Aviation Section of the Signal Corps and named Clark Field in September 1919 after Harold M. Clark. Clark later served as a landing field for U.S. Army Air Corps medium bombers and accommodated half of the heavy bombers stationed in the Philippines during the 1930s. It was very large for an air field of its day, and in the late summer and fall of 1941, many aircraft were sent to Clark in anticipation of a war with Imperial Japan. However, most of them were destroyed on the ground during an air raid nine hours after the Pearl Harbor attack. The base was overrun by Japanese forces in early January 1942 and became a major center for Japanese air operations. Japanese aircraft flying out of Clark participated in the Battle of Leyte Gulf, the largest naval battle of the Second World War. Clark grew into a major American air base during the Cold War, serving as an important logistics hub during the Vietnam War. The base was closed by the United States in the early 1990s due to the refusal by the Philippine government to renew the lease on the base. After extensive damage from the Mount Pinatubo volcanic eruption of 1991, the Philippine government attempted to reopen base lease talks, but terms could not be reached and the lease was not extended. Fighter planes regularly visited to participate in aerial warfare exercises at Crow Valley about 30 miles (48 km) to the northwest. In November 1973, headquarters for the 374th Tactical Airlift Wing was transferred to Clark Air Base. With this move came two squadrons of C-130E transport aircraft, the 21st Tactical Airlift Squadron and the 776th Tactical Airlift Squadron. On 29 October 1987, unidentified gunmen shot and killed three airmen. On 14 May 1990, suspected New People's Army (NPA) communist rebels shot and killed two airmen. A map of Clark Air Base, 1986. Angeles City bars were legendary, particularly around the red-light district on Fields Avenue. As a result, Clark's servicemen's clubs were under considerable pressure to serve its members with wholesome entertainment. All three were large-scale operations: the Officer's Club (CABOOM) near the parade ground, the Top Hat Club for non-commissioned officers (NCOs) near Lily Hill, which moved to near the Silver Wing in 1986, and the Coconut Grove Airmen Open Mess (AOM) housed in a large vaulted room that contained palm trees. The officer's club featured a four star dining room, but catered to NCO's during lunchtime. The airman's club got first dibs on Broadway shows and swing bands due to an agreement that whomever paid transportation costs got priority. The NCO club came second. The airman's club had numerous theme bars and rental girls for dance partners during swing band tenures on the large dance floor. The club security (bouncers) were outfitted in formal PI wear each evening of a different hue. The PI formal wear was lace shirts with French cuffs and very elegant. The volume of enlisted troops flowing through PI to Vietnam created a large audience for AOM offerings. The NCO Club was still a very extensive operation and operated an upscale dining room, an in-house thrift shop, a pinball arcade, and a calendar of daily activities. It regularly brought major bands and artists from the United States to perform. At least a hundred sponsored clubs and organizations were active on the base, including the Knights of Columbus, a Latino American club, the Civil Air Patrol, and martial arts dojos. Two major movie theaters operated daily: the Bobbitt Theater which played first-run films, and the Kelly Theater which showed older releases. By 1988 the Kelly Theater ceased showing films and was used mainly for Commander's Calls and large squadron-sized meetings. In the late 1960s and early 1970s, movies were also shown at the Bamboo Bowl, the football stadium on base. The Bamboo Bowl, later renamed Challenger Field, was used mainly for high school football games as the school did not have its own athletic field. In addition to high school football games, it also hosted recreational league football games for ages 8–18. The high school football teams were included as part of the recreational league. The base's sole high school, Wagner High, had multiple football teams. It was also used for the base's 11-man tackle football league, which not only included teams from Clark but from Subic Naval Base as well. FEN had two 24-hour radio stations: an AM station which broadcast news and popular music, and stereo FM which was dedicated to easy-listening and classical music. Local Filipino TV also aired newer American shows than FEN did. Unlike the local TV stations in Europe, they were broadcast in the same format as American TV and not dubbed in Tagalog, the local language. Likewise, several American-styled radio stations in Manila were popular with Clark residents: one notable example in the 1980s was 99.5 DWRT-FM. Two major annual events at Clark were the annual Chili Cookoff, held near the Silver Wing recreation center around September, and the Happening on the Green ("the HOG") in February. The HOG attracted thousands of residents. Amusements and rides were built and operated not only by Filipino entertainment contractors but also by individual Air Force units seeking to boost unit morale, showcase their talents, and raise unit funds. Climate at the base is characterized by two distinct seasons: a "dry season" from November through April, and a "rainy season" with monsoon rains that occur from May through October. During the dry season, winds are usually northeasterly and skies are fair. Some afternoon showers tend to appear by April. April brings the highest average temperatures of any month, though the hottest days of the year tend to occur in May. Due to the very dry state of vegetation at this time, ash and soot often falls on Clark Air Base as farmers burn their fields for planting. During drought years, wildfires occasionally broke out in the overgrown areas west of the golf course and northeast of the airfield. Rainy season normally arrives during the month of June. July and August are wet, with many dark overcast days, and frequent afternoon and evening rains. Typhoons are common in late summer and fall, approaching from the east. They are rarely strong at Clark Air Base as the facilities are far inland, and the typhoon circulation is disrupted by the Sierra Madre mountain range on the east coast. Rain and typhoon activity diminishes sharply by November and December, when the dry season arrives once again. Temperatures are at their coolest, with nighttime lows sometimes falling to 64°F (18°C) or lower. From 1953 to 1991, the mean daily low was 73.6 °F (23.1 °C) and the mean daily high was 88.1 °F (31.2 °C), with April being warmest and January coolest. The average annual rainfall was 78.39 inches (1,991 mm). ^ a b "PACAF Airmen stand up air contingent in Philippines". U.S. Air Force. Retrieved 30 April 2016. ^ Munoz, Carlo (6 July 2012). "The Philippines re-opens military bases to US forces". The Hill. Retrieved 3 July 2013. ^ Drogin, Bob (14 May 1990). "2 U.S. Airmen Killed at Base in Philippines : Military: The shootings, believed to be the work of Communist rebels, come on the eve of talks on the future of American bases". Los Angeles Times. Retrieved 9 November 2018. ^ CLIMATOGRAPHY OF THE UNITED STATES NO. 81, Monthly Normals of Temperature, Precipitation, and Heating and Cooling Degree Days, No. 91, Pacific Islands, NATIONAL ENVIRONMENTAL SATELLITE, DATA, AND INFORMATION SERVICE. Sheftall, M.G. (2005). Blossoms in the Wind: Human Legacies of the Kamikaze. NAL Caliber. pp. 480pp. ISBN 0-451-21487-0. Anderegg, C.R. (2000). The Ash Warriors. Government Printing Office. ISBN 9780160869419. Wikimedia Commons has media related to Clark Air Base.